When I’m 80, I sure hope I’m this cool. Last year, Osaka television program Yo~i Don! introduced a barber named Kiyoshi Kasan who enjoys Dark Souls II. This year, he’s once again been interviewed by Japanese TV. 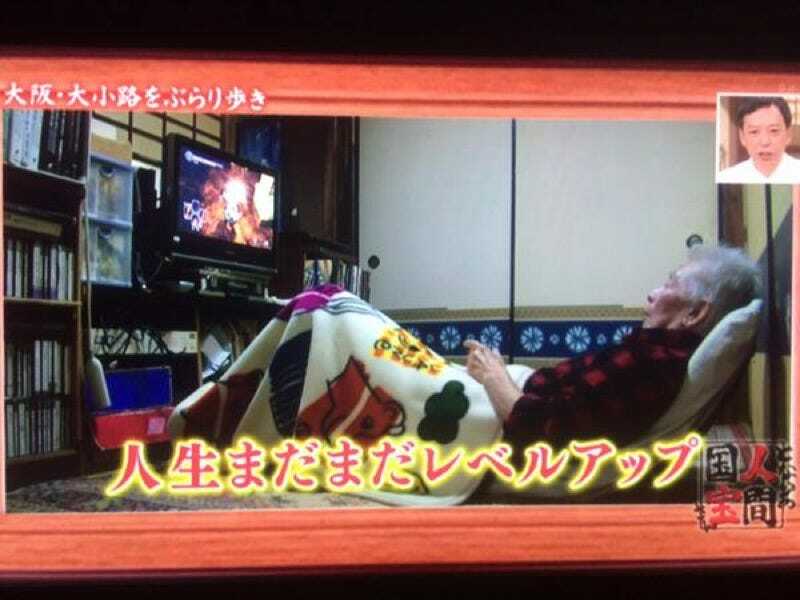 The top image, uploaded by Twitter user touketu16, shows Mr. Kasan playing Dark Souls II at home. Out of all the games to play, I could probably rattle off a few that were easier. While on the program, he talked a bit about the game. I cannot imagine seeing “You Died” over and over again when I am 80 years old. “I’ve never seen and elderly person play the PlayStation,” the show’s co-host admitted. Twitter user Teppeio1 uploaded images of Mr. Kasan ‘s most recent TV appearance. And a closer look at his game collection (also via Teppeio1), which includes lots of Final Fantasy and Resident Evil as well as Assassin’s Creed and Tomb Raider. He even owns strategy guides. As pointed out on 2ch, this is somewhat reminiscent of a recent tweet in which Japanese Twitter user Ymvus’s grandfather says he plays the Mystery Dungeon game Torneko: The Last Hope on the PlayStation every single day so he does not go senile. This is amazing because people in their seventies and eighties did not have PlayStations as kids. Our generations did, so expect this sort of thing to become much more normal. Oh, in about fifty years. This story was originally published on October 16, 2015. It has been updated with new images.